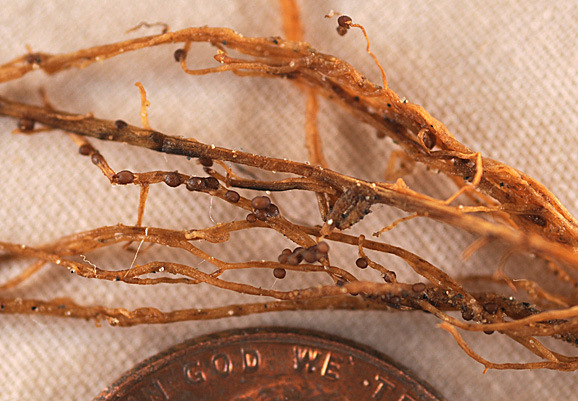 Soybean cyst nematode (SCN) (Heterodera glycines) is a microscopic plant-parasitic worm that is emerging as a major threat to soybean production in North Dakota. 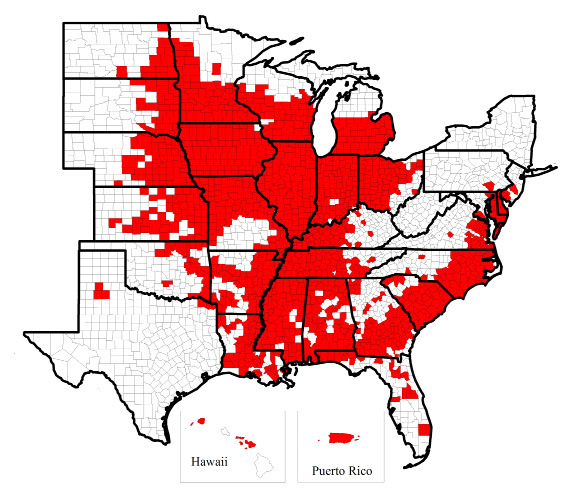 SCN was identified in the U.S. in 1954 and quickly spread through all the major soybean production areas (Figure 1). It first was detected in North Dakota in Richland County in 2003, and within a decade, SCN was confirmed in a dozen North Dakota counties (Figure 1). SCN is a manageable disease of soybeans, but proactive management is critical. Once you see above-ground symptoms, a yield loss of up to 30 percent likely already has occurred. Early detection and aggressive disease management before a significant yield loss occurs will not only protect yield, it also will help keep egg levels low so yield reductions are limited in the future. This publication provides fundamental information about SCN, SCN distribution in North Dakota and SCN management. Below Ground: Most people can see SCN cysts with the naked eye; however, they are approximately 1/40th inch long by 1/60th inch wide, making a hand lens crucial for identification. Cysts are lemon-shaped and initially cream-colored (Figure 2) but darken as they age, eventually turning brown (Figure 3). The lemon shape helps differentiate cysts from grains or sand, but cysts are readily visible using a hand lens (Figure 4). To see cysts on the roots, you must extract the roots carefully from the soil, but when the soil is dry, removing the roots without tearing off the females is difficult. 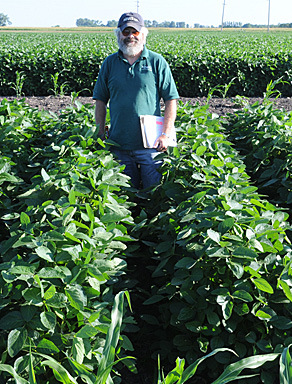 Above Ground: In general, soybean plants in SCN-infested fields can look healthy. 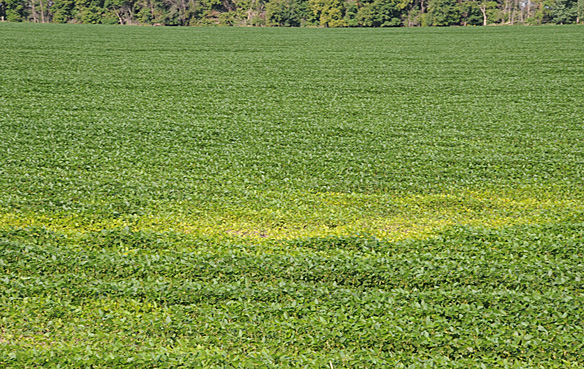 However, the appearance of yellow soybeans in oval-shaped areas in fields late in the season (often August) may indicate severe infection of SCN (Figure 5). Similarly, severely infected soybeans may be stunted and unhealthy looking (Figure 6). No above-ground symptoms are specific to SCN infection, which makes soil sampling and testing critical for detection. Anything that can move soil will move SCN. This includes soil on equipment, eggs/cysts suspended in flooding, dust storms, birds (feet and digestive tract) and tare soil. When selecting a location for soil sampling, consider the most likely way(s) SCN may have entered your field (more information is on the back of this publication). Host Range: The only important crop hosts in North Dakota are soybeans and dry beans. However, SCN can reproduce on some weeds, but more than 50 species of weeds have been tested in North Dakota and most are nonhosts or very poor hosts, with only henbit and field pennycress allowing substantial reproduction on roots. Canola and dry edible peas are considered non- or poor hosts, even though SCN parasitizes their closely related weed or garden species. Hg Types: Individual SCN nematode populations can be classified into “Hg” types, which are similar to “races” or “strains.” The Hg type indicates which source(s) of resistance that the nematode can reproduce on (thereby rendering the resistance less effective). To date, only Hg type 0 has been confirmed in North Dakota, indicating that all available sources of resistance are effective. Additional Hg types likely will occur as SCN becomes a greater problem in the state. SCN overwinters as eggs encased in the female cyst, which helps protect them from the environment and predators. After hatching and a first molt, second-stage juveniles (J2) emerge and penetrate soybean roots using a spearlike mouth structure called a stylet and then enter the root tissue. The juvenile nematode establishes a feeding site, called a syncytium, and becomes sedentary. The juvenile enlarges and molts three times to become an adult. The female adult remains attached to the syncytium for the duration of its life cycle. Once the female is fertilized, it enlarges into a lemon-shaped body, which can contain up to 500 eggs. As the female body enlarges, it often breaks through the epidermis of the root. The female dies when the plant matures and then turns into a brown cyst. The cyst is a tough structure that can protect eggs for years. Under favorable conditions, a life cycle can be completed about once a month. In North Dakota, two to three life cycles are thought to be common. The keys to managing SCN are early detection and keeping egg levels low. The most effective way to determine if you have SCN is by soil sampling, and information on where and how to sample is found on the back page of this publication. Once SCN is detected, planting resistant varieties and crop rotation are critical tools for SCN management. Resistant Varieties: Resistant varieties inhibit SCN reproduction. This helps protect yield by limiting parasitism on the crop and limiting egg level increase, which helps protect yield in future seasons. A greater number of early maturing varieties are being developed with SCN resistance. The two common sources of resistance are PI88788 and Peking, both of which are effective in North Dakota. Crop Rotation: Crop rotation is a critical component of SCN management. 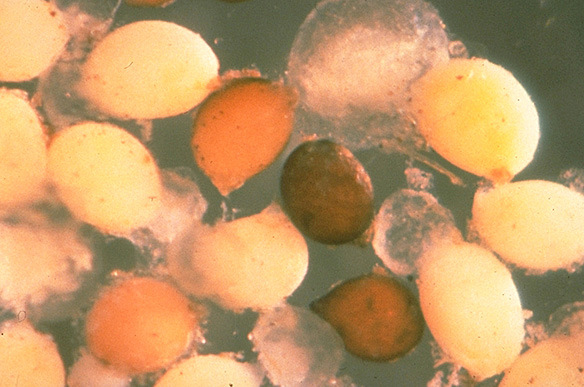 The greatest reduction in egg levels occurs the first year a nonhost is planted, but egg level reductions can be observed for additional years if nonhost crops continue to be planted. High egg levels can require a number of years in rotation with nonhosts to reduce to low levels. Sequential cropping of susceptible crops can spike egg levels high enough that growing soybeans or dry beans may not be practical. Similarly, sequential plantings of soybeans with the same source of resistance may facilitate the ability of the pathogen to overcome that resistance. Rotation of sources of resistance is recommended for long-term management of SCN. Nematicide Seed Treatments: Several seed treatment products aimed at SCN management are labeled and more are likely to be labeled in the future. However, the performance of nematicides depends on specific soil and weather conditions, which does not guarantee increased yields. They may have a fit in a management strategy in the future. They should be used only in addition to resistance and rotation. For information on labeled nematicide seed treatments, consult the most recent issue of NDSU Extension Service publication PP-622, “North Dakota Field Crop Fungicide Guide,” or download the NDSU Pest Management App, available for Apple and Android devices. Sample in the fall when SCN egg levels are highest, and consequently, the most likely time of year to detect SCN. Sampling can be done before or after harvest, but it should be done before any tillage is done in the field. Field entrance: SCN-infested soil often moves into new fields on equipment. Movement on equipment is thought to be responsible for its expansion across the U.S.
Flood-prone areas and low spots: Cysts will move with water, so areas that are prone to flooding and water pooling are likely areas where SCN will be introduced. SCN can be moved by birds, on their bodies and in their digestive tracts, and birds frequently visit wet spots in fields. Consistently low-yielding spots: SCN occurs in patches in fields, can reduce yield with no above-ground symptoms and will continue to cause yield loss until it is managed. 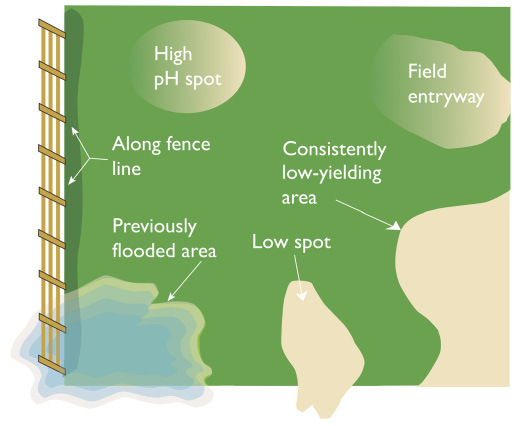 Shelter belts/fence lines: Cysts can move in high winds and are deposited as the wind speed slows. In North Dakota, this usually means shelter belts. Yellow spots showing up in August: The damage from high SCN levels usually begins to appear in August, especially if plants are water-stressed. Any lens-shaped areas of fields turning yellow in August are suspicious. High pH: High pH soils are very favorable to SCN and, as a result, SCN damage often is noticed first in high pH spots in fields. Go where SCN is, and aim for the roots. Sampling is most effective when the samples are collected within a few inches of the soybean stem and 6 to 8 inches deep into the soil. More samples are better. Take 10 to 20 soil cores or thin shovel slices in a suspicious area and bulk the sample. Keep the sample relatively cool and get it to the lab quickly. SCN is a tough worm, but SCN will struggle if the sample sits on the dash of a pickup in the August sun. Lab results will be presented as eggs/100 cc soil, which is the number of eggs in approximately a 6-ounce can. “J2,” which refers to the second-stage juvenile worm, also may be included,. Think of the egg level as your “risk” factor: the higher the number, the greater the risk. Very low levels (less than 100) could be false positives and should be viewed with some caution. We recommend resampling. Very high levels (greater than 10,000 egg/100 cc) likely will impact soybean production for years to come. What do you do if you have SCN? We recommend beginning management strategies if you find any positive samples. What do you do if you don’t find SCN? Be vigilant and sample again next year.